​Opened Now for 5 years we've come a long way in improving our art & framing over that time. We now regularly exhibit the work of over 20 artists & can readily obtain original art from many more. 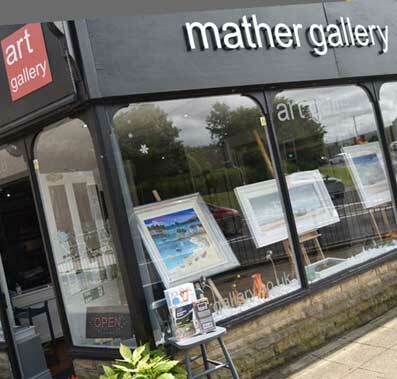 The Mather Gallery doesn't sell prints in its high street gallery: Why? Discerning clients want original art, something that's a part of the artist & something to be cherished we find Originals to be much better value for money. ​The Gallery also has a magnificent collection of Murano Glass Lighting, Jewellery & Vases being the sole UK stockist for certain artists. Picture Framing: We Now Offer Clients a Picture Framing Service for their cherished original paintings that may be in need of need refreshing.